Ruby Shang was a senior manager at the Clinton Foundation from 2003 through 2012. As the Foundation’s Regional Director for Southeast Asia, she established the Clinton Health Access Initiative in 7 countries. Later in 2008, she assumed additional responsibility for the Clinton Climate Initiative, implementing sustainable Energy Efficiency Programs and Forestry Programs in 11 cities across China, Japan, Korea and Southeast Asia. Her last position was Senior Advisor to the Foundation. Ms. Shang is currently a member of the Brown University President’s Leadership Council, and during the 2016 US Presidential campaign, she served on Secretary of State Hillary Clinton’s Asian American Pacific Island Council. 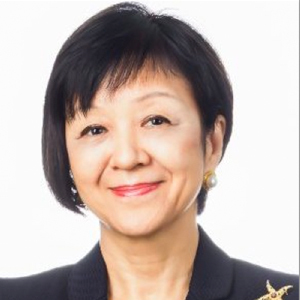 She currently serves on the Board of the Asian Cultural Council, the Bill T. Jones/Arnie Zane Dance Company, and the Asia Pacific Leaders’ Malaria Alliance. Formerly, Ms. Shang was Chair of the New York State Council of the Arts Dance Panel and a member of the Board of Governors of the New York Foundation for the Arts and the American Chamber of Commerce in Hanoi. She received a BA from Brown University.